These two teams last met in Round 4 of the regular season in Lismore with Brisbane City the eventual victor. Tonight they met again in the first of two Semi Final matches with Country again hosting the Brisbane boys and looking for redemption. There’s no better way to describe the game tonight, than a wonderfully torrid affair. Big hits and plenty of physicality were the order of the night. The Eagles were dealt the biggest blow though with the very late withdrawal of Steven Hoiles (c), Mitch Chapman and Cam Treloar. Even with the late injuries the two teams were fairly evenly matched and a with a strong breeze at the back of the home side it looked to be advantage Eagles. That was until 2 minutes in, when Brando Va’aulu latched onto a super offload and scored the opening try. The Eagles struck back almost immediately through flyhalf Sam Windsor, with some individual brilliance getting him across the line. The TMO was called in to review what looked to be a fairly straight forward try but it was eventually awarded. The kick made it 8 all after 5 minutes. As is the way with the NRC the action didn’t stop there. Jake McIntyre had a kick charged down which saw Mau’fu with only the tryline in front of him when City fullback Va’aulu made a spectacular try saving tackle, dislodging the ball as Mau’fu was diving over. The celebration was short lived though as Samu Wara dived over in the opposite corner shortly after. The conversion was missed and the score was 13-8 to the Eagles. The Eagles seemed determined not to use the ball and were gifting possession to City all night. City turning the possession into territory working their way into the red zone. It looked as thought City No 8. Jake Schatz had crossed the line but the only man who’s opinion matters wasn’t convinced. A number of attacking raids on the Country line were for nothing until Will Miller was shown a yellow card for a cynical infringement. After a couple of strong scrums, the Eagles front row were issued a warning for collapsing. The City chose to scrum again and after a big second shove were awarded a penalty try. 16-13 to City. As they did after the first City try, the Eagles hit back with some dominant forwards play of their own setting up a driving maul from a lineout just under 20 metres out. No 8. 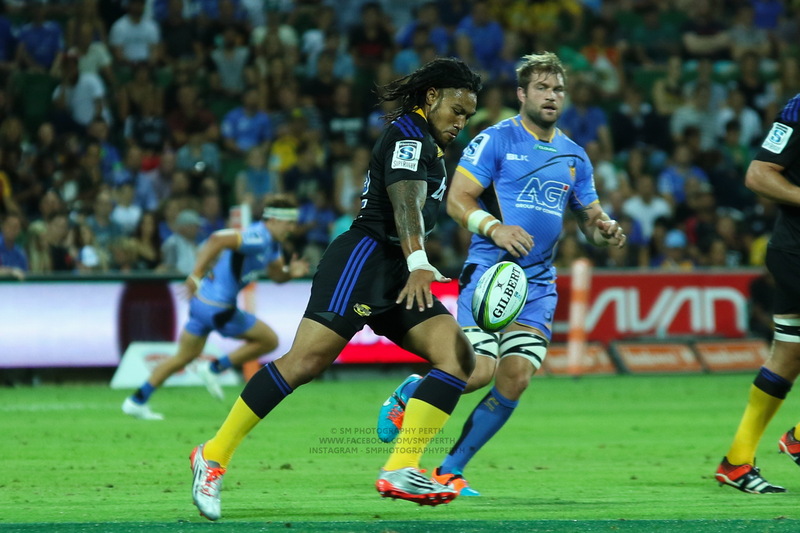 Ita Vaea positioned himself well at the back of the maul as the Eagles it rumbled the ball toward the line. Vaea spun off the back and was almost brilliantly held short by City winger Chris Kuridrani but the TMO was called in and it was decided that the ball had in fact touched a white blade of grass. Just before half time Ed Stubbs plucked a slow pass from McIntyre and raced away 50 metres to score and the Eagles took a 26-16 lead to half time. I felt that Country were the better side in the first half. City had almost all of the possession and territory in the first half and were still trailing by 10 points. In the second half, it was City’s turn to run with the breeze. Having to make all of the tackles in the first half and having less players involved in Super Rugby started to show with the Eagles players starting to visibly tire. Some beautiful interplay between Kerevi, Kuridrani and Va’aulu saw Brando cross for his second try of the night, again marked by one of the more odd post try celebrations I’ve seen. Rubbish kicking was affecting both sides but when a grubber kick from the Eagles was blocked and regathered by City centre, Toby White, that was the nail in the coffin, with White beating one tackler and racing away to score the final try of the match. In the last 20 minutes both teams gave their opposition chances to win but neither team stood up. City hanging on to their 6 point lead to book their place in the innaugural National Rugby Championship final. The other finalist to be decided in tomorrow’s Semi Final between Melbourne Rising and Perth Spirit. A win to the Rising will see the final played in Melbourne, while a win to the Spirit will mean a home final for Brisbane City. I got the feeling when Nick Frisby was hobbling around that his inevitable exit from the game might be the turning point for the Eagles but it didn’t pan out that way. 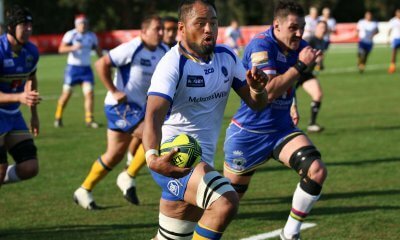 The two second half tries in 3 minutes to Brisbane City (Va’aulu & White) was the clear game changer. He hit hard in defence and worked tirelessly all night. He’s a big unit but still plays bigger than his size. The MoTM for mine was Eagles #6, Tala Gray. I haven’t seen much of the Eagles this season but what I saw of flyhalf, Sam Windsor was impressive. Whether he just looked better as his opposite number was having a nightmare or whether he is an emerging talent, only time will tell. One to watch nonetheless. I thought defence was slightly better, neither team leaking too many tries. Which will be the test if we play the Rising. I think the Reds back line looks to be a cracker for next year with more powerful options than we have had in a while. Hoping Thompson will be a good addition in this area. Hard as nails and a great work rate. didn’t know you were on this website mate… plan on making your debut next year or playing it safe? It was a good hit out for Brisbane and they deserved the win. Looking back at it will Miller’s yellow card really shot the Eagles in the foot, it was so unnecessary and dumb. That felt like a semi-final with more venom in defence than the previous fare. The Eagles were cutting off the City backline before the ball got past their halves, but it was good to watch. Cheers for the report. The attendance was about 500. The venue was only confirmed a week or so before the match, which was a problem, but there also needs to more advertising for these games because even a lot of rugby people haven’t known they were on. Brando Va’aulu punching the ball from under Ma’ufu’s arm as he dived over the line was the cleverest bit of rugby I’ve seen in a while. It was inconceivable that at try would not be scored. I used to bag Brando when he started with the Reds but I am a big fan now. I love the Reds and I love the second row. That probably tells you all you need to know about me. I can often be found engaged in pointless arguments in the GaGR forums as 'Scoey".